Gruesome Playground Injuries is all about variations on themes. Director Chris Bretecher writes that, in following the characters through their unlikely and unlucky journey, “we acknowledge topics of mental health, sexual consent, substance abuse, self harm, and risk taking behaviours”. This is far clearer in the literature than the text: the playbill explains the production’s partnership with LOFT and the insert gives a comprehensive list of crisis hotlines and support services. This is laudable, and the fact that it’s remarkable at all is sobering, but it suggests a more explicit connection with the work than is readily apparent. The play’s structure is to blame. After their introduction in a school nurse’s waiting room, we run into Kayleen and Doug at their fleeting reunions across the years. Some new tragedy is the impetus for exploring the trauma in between as they and the audience rush to fill in the blanks before the years roll forward once again. This injects a dark inevitability into their dynamic – we want them to meet again, and know they surely will, but fear this can only be in unhappy circumstances – but it fails to foster our initial investment in their friendship. The actors do a fine job with their material as producer Alice Lundy’s Kayleen sketches a carefully evolving contrast with Anurag Choudhury’s Doug, whose childlike intensity is constant as he veers through adulthood. What’s missing from Rajiv Joseph’s work is a credible story of what binds two very different figures – Kayleen and Doug, yes, but also any two of the Kayleens we see in these snapshots. We miss the basic ingredients of friendship: the shared experiences, the in-jokes that mean so much more than they should, the easy comfort that comes from time together. Without these, dynamics that can be excused between friends look more sinister. Doug’s clinginess seems more aggressive or possessive than eager or caring; Kayleen’s erratic treatment of him feels more cruel than kind. 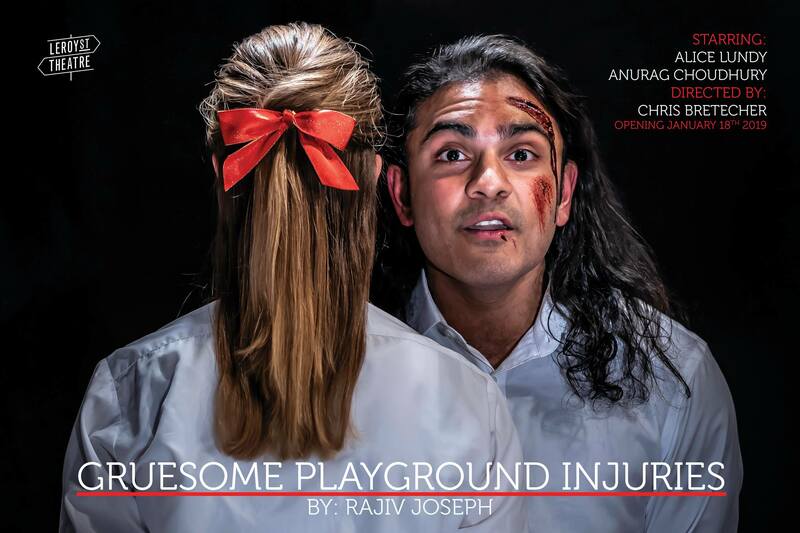 Gruesome Playground Injuries proves a timeless truth about relationships: it’s easy to convince ourselves that we want or need someone in our lives, but much harder to convince onlookers that it makes sense. As Kayleen and Doug are discharged for what’s definitely not the last time, the audience is left in two minds: glad they have each other, sad they have no one better.